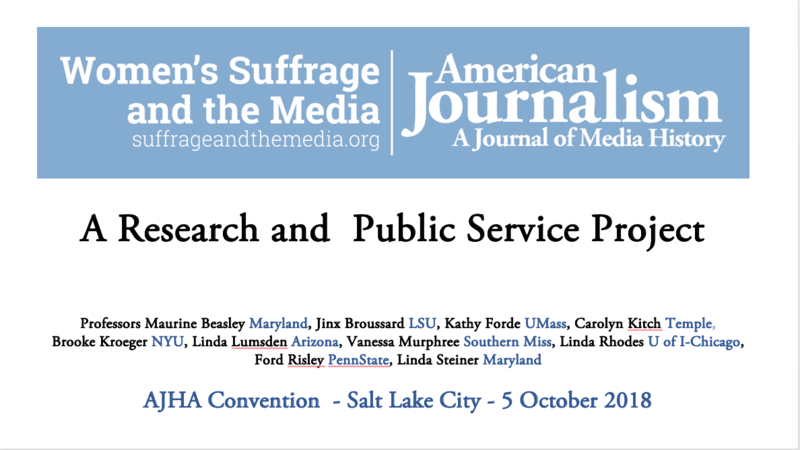 but is now in final edits for the special “Suffrage and the Media” issue of American Journalism: A Journal of Media History, to be published in Spring 2019. 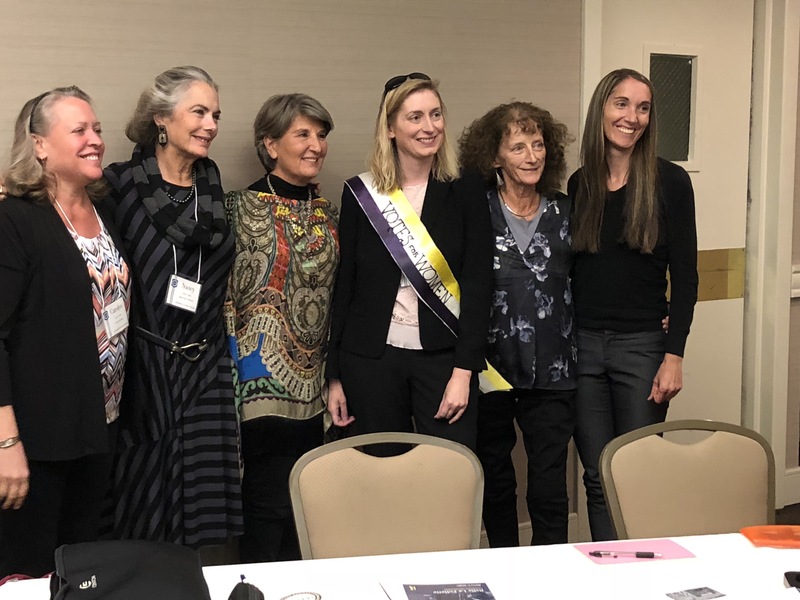 Our panelists were: as moderator, Carolyn Kitch (Temple), guiding panelists, Linda Lumsden (Arizona), Teri Finneman (Kansas), Amy Easton-Flake (Brigham Young), Nancy Unger (Santa Clara) and Brooke Kroeger (NYU). 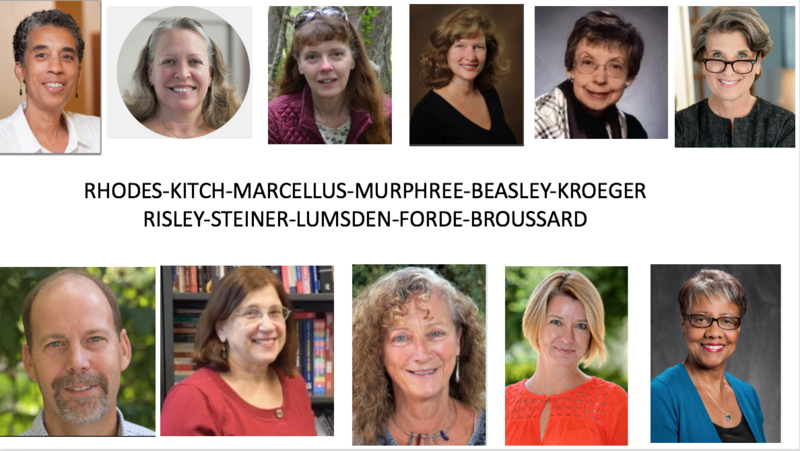 This panel will feature authors and editors of a special issue of American Journalism on “Women’s Suffrage and the Media,” planned for publication in 2019, a year in advance of centennial of that achievement. Its purpose is to offer fresh research perspectives on both familiar and lesser-known aspects of the role of journalism, publicity, visual communication and other mediation of the suffrage campaign. 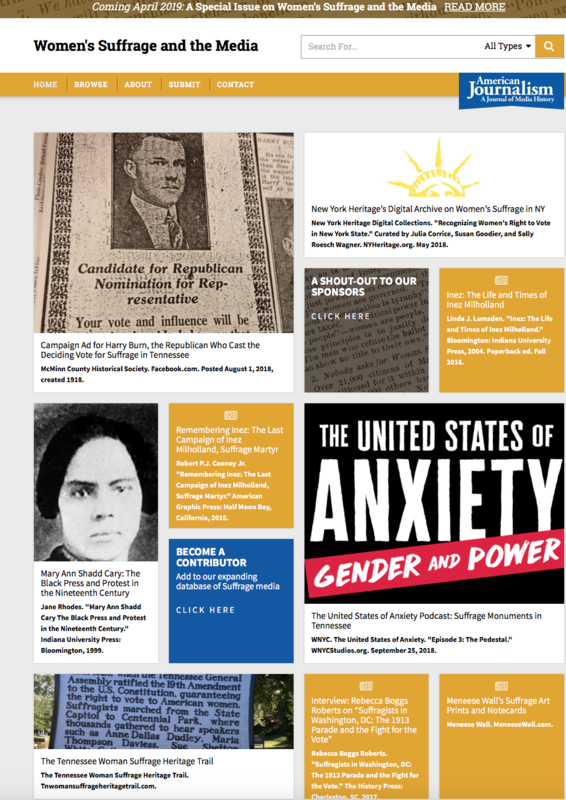 The panel also will showcase the project’s companion website, suffrageandthemedia.org, which already is live and which offers primary-source materials, links to essays and other new historical work, and information about the centennial. And here is a little more about what each of us presented, starting with the topics of three of the six articles in the forthcoming special issue. Amy Easton-Flake: “Literary Works in the Revolution and the Woman’s Journal: Clarifying History. We met in March 2017 in New York City, in August 2017 in Chicago, and again in March of 2018 in New York. During that year, we issued the Call for Papers, received 25 five-page proposals, selected the five for which we had page allotment, added an historiography, broke into teams of two to review each submission, raised funds from NYU and Humanities NY to create the database, SuffrageandtheMedia.org (HT Katy Dwyer Design and NYU Journalism’s own web developer Garrett Gardner), which went live June 10,2017, only three months after that first March meeting. The model could be applied to any subject matter, really. All it takes is a committed team. I also previewed a clip from the first of the author videos being created for the launch of AJ‘s Suffrage and the Media special issue with new research from (in addition to the AJHA presenters, Professors Lumsden, Unger, and Easton-Flake,) Linda Grasso (York/CUNY) on The Crisis and the Masses and their 1915 special suffrage issues and Tiffany Lewis (Baruch/CUNY) on the suffrage hikers. Not much longer to wait for it all, and how we will be featuring this fine new work at suffrageandthemedia.org, which has the Tennessee state centennial on the home page this month. Have a look.